Global organizations are complex, challenging… yet dynamic environments. As a Thought-Partner and Trusted Advisor, I bring knowledge forged from years of extensive experience to help you prepare your organization for QUANTIFIABLE SUCCESS. I help you identify and examine the factors contributing to your effectiveness… as well as those detracting from your ability to maximize your business results. I work directly with you, and your teams, to develop a global infrastructure to effectively ensure you are one of the 24% who succeed! As efforts to adapt yourself, your team, or your company continue to be an uphill battle, I meet you where you are, take the time to understand your needs, assess the situation and build a succinct roadmap that ensures you ARRIVE EXACTLY WHERE YOU WANT TO BE! I stay fully engaged throughout the process, making sure you are on target to exceed your every expectation… every time. Regardless of the challenge, my goal is to help your organization leverage what is working, while finding new opportunities for growth that will enable you to achieve sustainable, break-through results. My focus is on ensuring you not only arrive on time and under budget – but also on ensuring you receive a STRONG RETURN ON YOUR INVESTMENT. As companies continue to struggle with project success, my clients receive an average three-fold return on their consulting engagement – making partnering with me a very profitable proposition! 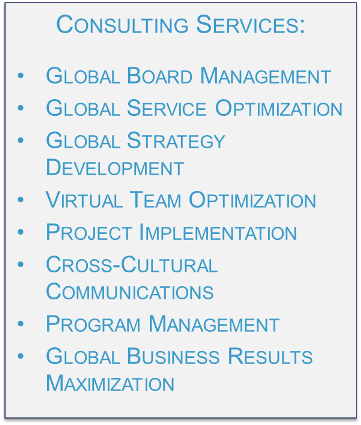 To discuss how I can help your organization, please click here to contact us.